Both Clean Asia and Fractal Fighter were recently mentioned in Download.com's The Daily Download section. The latest edition of 1UP's Weekly Freeplay features Orisinal, Nitrome, Rose and Camellia, Nanaca Crash, Uchu Force and Weird Worlds: Return to Infinite Space. Here's a special one: Oddbob's picks, namely Inyou Douji Monogatari, Rose and Camellia, Blue Wish Resurrection and Burn the Trash. smila's IO remake is out; Devlin's Losted gets a colour version. A number of cropped screenshots from Wiebo's upcoming shooter can be found over at his development journal. Postman (Shoot the Core) and Hunter's Quarter Munchers' blog is up. Moonpod's Mr. Robot was chosen as the first title to be featured on Kotaku's Game Club. A discount for the game will be offered during this period. There is also a lengthy interview with Nick Tipping of Moonpod posted here, as conducted by Max Geiger. Nick reveals that War Angels will be their next release (outdated info), and Elite as his favorite game of all time. Gameplay video recorded from a Dream-Build-Play (a Microsoft XNA Game Studio contest) competition entry, which one of Moonpod's forum member described as a Raid of Bungeling Bay remake. 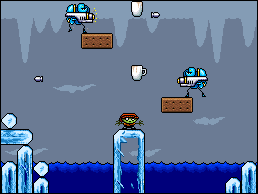 Gameplay video of a Catchat remake developed using Microsoft's XNA by Wes Ehrlichman. Registration for the fifth Pyweek competition is now open. The contest is scheduled to run for an entire week, starting from September 2nd 2007. DHC will be participating in the next 3Punge (Three Minutes Game Contest) with their entry entitled Sonic Ironstorm. The vertical shooter is expected to share many similarities with Demolition Gunner.